Acne is one of the most common skin disease affecting millions of people across the globe irrespective of their gender, race or age. It is characterized by frequent outbreaks of pimples, whiteheads, blackheads and inflammations marked by scarring and redness of the affected area. Acne scars are usually caused by the inflamed blemishes as a result of the excessive accumulation of oil or sebum along with dead skin cells and bacteria which causes a swelling forcing a break in the follicle wall. The skin, as a result, automatically starts repairing this damage by forming new collagen fibers which is not as smooth as original skin and comes forth as scars. Over time a lot of new treatments were developed to treat these acne scars which so often make us shy of socializing. This article will talk about the effectiveness of the method of dermabrasion to deal with the problem of acne scars. It is a treatment often used to do away with acne scars and minute wrinkles. 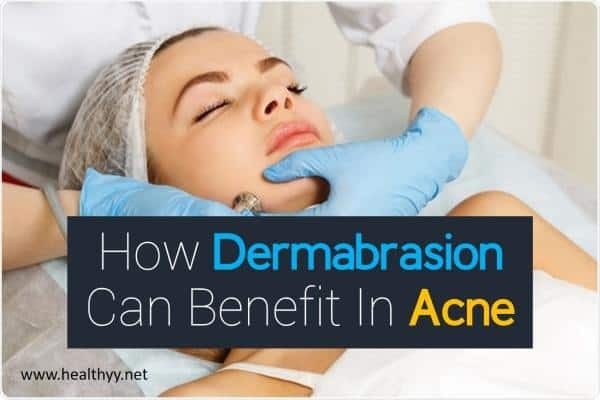 How does Dermabrasion treat acne? Dermabrasion is a type of surgical procedure to refinish the skin’s top layer through surgical scrapping. It is performed only by registered dermatologists of plastic surgeons who are specifically trained to carry out this surgery. It simply involves deep abrasion of the skin in order to sharpen and even out the irregularities of the skin. It involves the use of strong abrasive devices which might be wire brush, diamond wheel, sand paper, salt crystal or other mechanical instruments. Since it is an invasive procedure, it is done under the effect of a local anesthesia. Also it should be performed only in a health centre under the supervision of a doctor. The main purpose of this treatment is to clear out the imperfections of the skin and especially focuses towards diminishing scars. It is also used to make the skin smooth and remove and repair the uneven skin tone and damaged skin in general. It is mostly used for facial skin. However, sometimes, it might also be used to remove pre-cancerous growth from the skin called keratoses. It is very important that you do not confuse the two procedures of dermabrasion and micro-dermabrasion. The latter is a relatively new, non-surgical procedure which can also be performed by non-trained persons. It uses an abrasive tool with rough edges to remove the upper layers of the skin. This process creates a wound (superficial and minor), making the skin bleed which will induce the immunity to take strike naturally and start healing. There is new skin growth in this healing process. The skin thus formed is damage free and un-spoilt and it replaces the skin that was earlier removed by dermabrasion. The depth to which the skin is removed or re-surfaced depends upon factors like the coarseness of the abrasive tool, the speed with which it rotates and the amount of pressure applied while under going the treatment along with the skin type of the person concerned. Before the treatment begins, the area to be treated is cleaned, marked and numbed with the help of a local anesthesia. Ice packs are also applied to the skin for 30 minutes to harden the skin for abrasion. Alternatively a cryogenic spray can be used. This will only facilitate deeper abrasion. Stronger anesthesia might be used for larger areas to be treated. Treatment is done by taking small areas at a time. After the top layer of the skin has been taken out, gauze is used to stop the bleeding caused as a result. The treated area is covered with a dressing after the procedure is complete. This treatment is ideal for problems of acne scarring, keloids, traumatic scars, rhynopyma, wrinkles and tattoo removals. It is relatively preferable for lighter skinned people than for dark skin people to undergo dermabrasion as there are chances of hyper pigmentation. Patients who have been on isotretinoin or accutane recently should avoid this treatment. It usually amounts to 1,500$ per treatment and repeated treatments might be required. The re-growth of new skin requires 5 to 8 days and it takes approximately 6 to 12 weeks for the redness of the new skin to fade away. Make up should be avoided till this period. Normal life style can be resumed if there is no pain after the treatment. Pain killers might be taken otherwise. The treatment is painless. Patients experience little or no pain. It offers deeper penetration to alleviate the appearance of scars. Makes the skin fresh and youthful. The new skin is fairly smoother. Scarring. The risk is higher with deeper abrasions. Redness of the treated area which is temporary and usually fades away. Acne breakouts. These are very easily treatable. It might cause hyper or hypo pigmentation. Infection. This is fairly rare. However, risks can be checked by taking an anti-viral before the treatment starts. It can also be treated with anti-biotic. He face should be cleansed every day several times in order to prevent infection and crusting of the skin that sometimes may occur. The dressing on the treated area must be changed frequently and also the ointment in order to promote healing and keep the area moist. Sun exposure should be avoided and whenever this is not possible, sunscreen should be used. If you have a history of infection with herpes simplex virus, then you must take acyclovir drug, which is an anti-viral drug, given to prevent infection. Inform your doctor about any yellow coating or crust that might follow the treatment. If the redness persists for a long time, inform your doctor. We did an analysis of online consumers to see how their experience was while undergoing this treatment. Here is a summary of what they liked or disliked about it. Improves texture: A lot of consumers were of the view that after undergoing the treatment, their skin became more even in tone and texture. It made their skin smoother and softer by eliminating the irregularities. Regular session: A few consumers complained that one problematic thing with the treatment is that you need to have regular sessions with it. It is not a one time solution. Besides the treatment in itself is expensive and going for regular sessions only adds to the burden. Pores: Some consumers were disappointed that while clearing their skin of irregularities, dermabrasion also tended to make their pores larger by eliminating the tissues. This caused further problems. Pigmentation loss: Dermabrasion often leads to hypo or hyper pigmentation. A lot of consumers faced this problem and were dissatisfied with it. Dermabrasion is a long time tested method and has been in use even before the laser treatments were introduced. It is a time effective method and causes no or less pain. The downtime is also less relatively. It heals quickly and can also cure deep scars. If you have long been suffering from scar issues and are not willing to face the probable risks of undergoing a laser, this treatment is definitely worth a try.